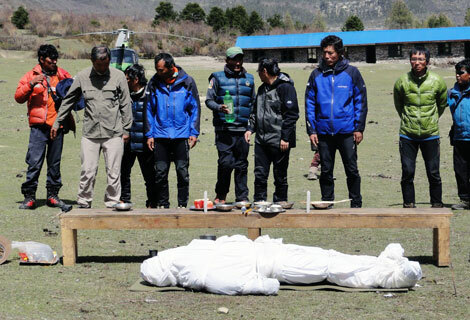 Lost body recovered from Manaslu Base Camp – Summit Helicopters Pvt. Ltd. Early morning today Fishtail Air’s AS350-B3+- AJI was all setup for a recovery flight of human remains from Manaslu Base Camp II (approx. 6400m). Captain Ashish Sherchan and Air Zermatt’s Captain Daniel Aufdenblatten were under command of our helicopter. 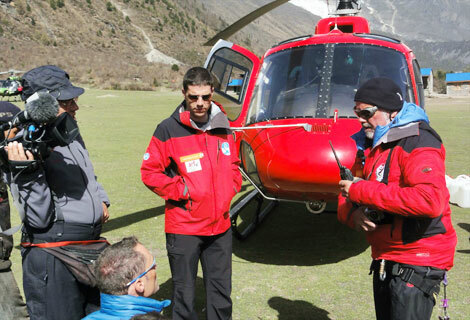 They took off from Kathmandu along with AS350 B2- AIW alongside flown by Captain Jurg Segessenmann and the camera crew for the filming and assistance for the operation. 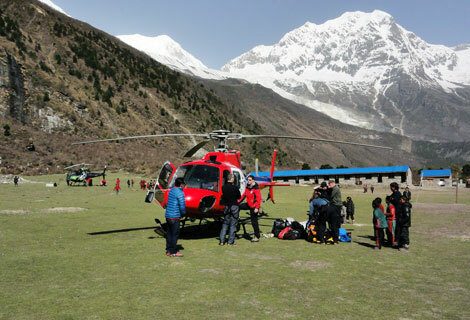 The two helicopters flew side by side to Manaslu Camp II where the body of a South Korean mountain climber Mr. Park Haeng Su was recovered from 6400m. Late Mr. Su and his friend were on their way to the summit of Manaslu (8163m) a year ago when they experienced tough weather. As a result of whiteout they lost their way. Our helicopter had flown there immediately as they called for rescue but the search was futile. A year later the Sherpa’s found the body and once again Fishtail Air was handed over the responsibility of bringing his body down. 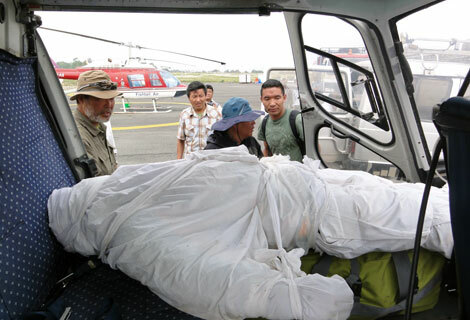 The tough mission was a success when the body was brought to Kathmandu Airport from where it was transported immediately to Teaching Hospital for post mortem. Late Mr. Park’s family and friends were here to receive his body. Fishtail Air’s condolences to Mr. Park’s family and we hope that our contribution to a better farewell proves to be of some help. We shall continue with the search for Late Mr. Park’s friend who was also lost along with him on their ascent. We also thank Captain Daniel Aufdenblatten for flying with us this season as this was his final mission before he left for Switzerland this evening. Posted in: Company News, Rescue Mission, Tourism Articles.